The links below represent our ever growing collection of books and source documents designed to tell the tale of the men and women who played a significant role in American History. Andrew Jackson by William G. Sumner – When Andrew Jackson was President most things were done in Washington just as he ordered them to be done. His friends declared that this was so because in most things his will stood for the will of the American people; his enemies, that they were done for no good reason whatever, but only because a despot commanded his slaves to do them. Frederick Douglass by Booker T. Washington – The life of Frederick Douglass is the history of American slavery epitomized in a single human experience. He saw it all, lived it all, and overcame it all. John Adams – Statesman of the American Revolution by Mellen Chamberlain – John Adams entered public life with the first session of the Continental Congress, which met at Philadelphia, September 5, 1774, and remained in the service of the country almost uninterruptedly until the close of his administration, March 4, 1801. John Locke by Richard I. Aaron – The first aim of this book is a sound exposition of Locke’s writings. The book is divided into three parts. Life of Dolley Madison by Maud W. Goodwin – Dolley Madison was First Lady of the United States from 1809 to 1817. She was notable for her social gifts and helped define the role of the First Lady. Life of Catherine Schuyler by Mary G. Humphreys – Through the position of her own family and as the wife of General Philip Schuyler, she is a representative figure among the women of the Dutch Colony and the matrons of the Revolution. Life of Eliza Pinkney by Harriet H.Ravenel – Eliza Lucas Pinckney changed agriculture in colonial South Carolina, where she developed indigo as one of its most important cash crops. Life of George Washington by Edward Everett – The reader will see that George Washington was emphatically a man of the people, who grew up in the midst of the people and understood them well. Life of James Madison by Sydney Howard Gay – Madison is one of the men of whom the country has always, and with good reason, been especially proud. It was not alone that his character was high, but his qualities as a statesman have been recognized as of the first order. None of our public men has been more useful to the country. Life of Margaret Winthrop by Alice M. Earle – Margaret Winthrop was the wife of John Winthrop, the first governor of the Massachusetts Bay Colony. The pair are notable for the survival and character of the love-letters which they wrote to each other in which the couple put their love of God before their love of each other. Life of Martha Washington by Anne H. Wharton – The story of Martha Washington s life has not been an easy one to tell, so largely has she, as a distinct personality, been overshadowed by the greater importance of the figure that has stood beside her. Life of Mercy Otis Warren by Alice Brown – Mercy Otis Warren, sister of James Otis, was born in Barnstable, Massachusetts September 1728. She was important as a political writer and propagandist of the American Revolution. Life of Samuel Adams by James K. Hosner – In the constellation of great men, which adorned the revolutionary era few shone with more brilliancy, or exercised a more powerful influence than Samuel Adams. Life of Thomas Jefferson by B.L. 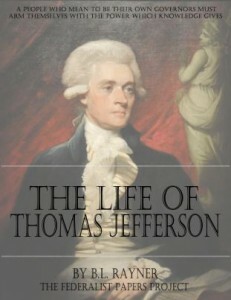 Rayner – Rayner’s The Life of Thomas Jefferson was published just eight years after Jefferson’s death. It was intended to inspire the reader with a full appreciation of the distinguished deeds and writings of one of the great political leaders of this millennium. Patrick Henry – American Statesman by Moses Coit Tyler – Patrick Henry was a consistent advocate of State Rights, and was ever jealous of any infringement upon them. For that reason, he was opposed to the Federal Constitution, and in the Virginia convention, called in 1788, to consider it, he opposed its ratification with all the power of his great eloquence. Real Benjamin Franklin – The Real Benjamin Franklin seats us across the table from the one person who really knew Benjamin Franklin — that is, Franklin himself — and gives him an opportunity to explain his life and ideas in his own words. True Thomas Jefferson by William E. Curtis – The True Thomas Jefferson is not a formal biography, it is intended to be a series of sketches as graphic and as accurate as possible, without partisanship or prejudice, of a remarkable man.